I love Coffee! Latte to Iced Coffee, i could drink them all the time :P But now i have turned vegan, my diet had to change! All of my milky, creamy...well lets face it, delightful drinks have had to go:( *bye bye* But i have found, there are a lot of places that have taken dietary needs into consideration and they taste just as good. Costa Coffee is a British Multinational Coffeehouse & Company. Costa is big here in the UK and is the 2nd largest Coffeehouse chain in the world. I have used Costa for many years, and every single drink i have ever had from there has been on point. Costa, like Starbucks, has a great variety of different drinks, Iced to Hot! But what i didn't know, is that most of their drinks can be made Vegan and Sugar-free. They taste just as good! At Costa, i would normally order a Medio Sugar-free Gingerbread Soya Latte...it is delightful! It definitely reminds me of christmas, which is always good! Make sure you ask to leave out any added ingredients like Whipped cream,Biscuits,, Chocolate drizzle's as they contain milk. I am very disappointed with Costa's lack of vegan food..unlike Starbucks! The only food i got offered when i went in to my local Costa was a small bag of dried Mango. The man who served me in Costa actually didn't know if they sold Vegan food or not! I hope this helps anyone struggling with choices of Vegan drinks on the go. Make sure to follow me so you don't miss out on my latest yummy posts and advice! thankyou, glad you like the post! Hi, I ordered a soy latte from costa the other week and I'm scared it might have been normal dairy milk as I'm someone who's easily worried. Are their soy lattes typically thin and watery in texture? 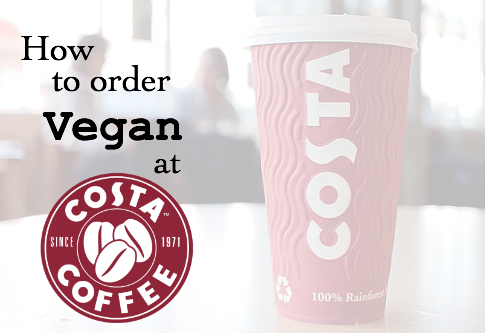 It was my first time ordering vegan at costa. Ah it was pretty watery so it must have been soy! Thanks for the clarification/reassurance but yup, next time I'll ask just to make sure! Looks to be a good post. Thanks for sharing some useful information on great coffees and delicious food that makes up your day.